An aerial overlay view of the new CTEC facility and related parking. 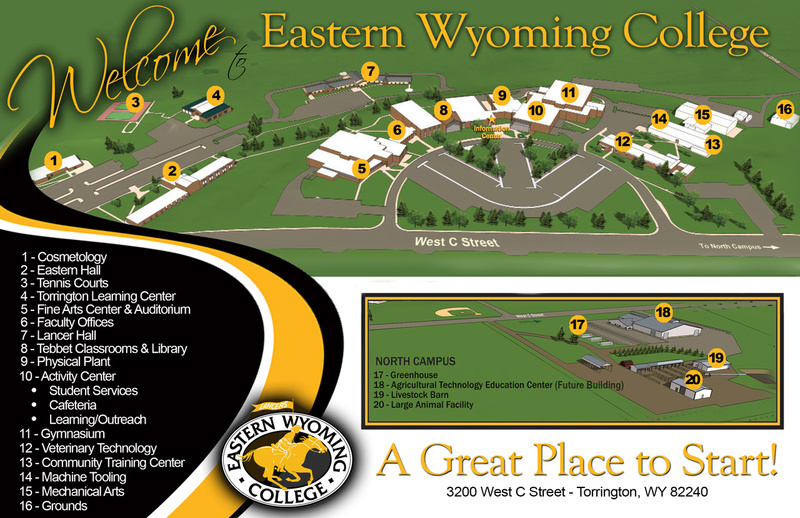 Eastern Wyoming College is sharing information regarding upcoming construction of the Career and Technical Education Center (CTEC) project to help answer questions and alleviate concerns. This facility will house programs in welding and joining technology, machine tooling, cosmetology, and health technology. It will also be the new location for Community Connections – the newly combined Community Education and Workforce Development offices. This facility will be located north of the current main entrance of the campus and will expand out to part of the current softball field, along West C Street. The CTEC is expected to add approximately 69,000 square feet to EWC’s main campus. This $23 million dollar facility is being funded with $20 million from a Wyoming State Legislature appropriation with the difference coming from the general obligation bonds supported by Goshen County voters in November, 2014. The scope of this project also includes addressing long-time drainage issues which have deteriorated the surface of the main parking lot and the parking lots north of the Verl Petsch Jr Activities Center. The current Mechanical Arts building will be razed as part of the drainage and parking project. The new parking lot in that area will be much larger and will better accommodate buses and large vehicles. It will also provide close access to entrances on the north side of the Verl Petsch Jr Activities Center, the Veterinary Technology building and the CTEC building. The parking in the front of the campus will also be redesigned with designated parking in front of the Fine Arts Center and CTEC. This will increase the number of handicap accessible spaces available on campus. There will also be designated spaces in front of CTEC for Cosmetology clientele. The College currently has 681 parking spaces supporting all of the Torrington facilities. After construction of CTEC, there will be a total of approximately 753 spaces available, a net gain of 72 parking spaces. The final parking numbers will be approximately 19 parking places in the Fine Arts lot facing C Street; 30 parking places on the front side of Fine Arts; 42 parking places in front of the new CTEC building; 6 reserved spots for Cosmetology customers; 13 parking places on the north side of the CTEC building for faculty and staff. The remaining parking will be in the new lot where MA/CTC is currently located. The College has worked with the State of Wyoming and their selected architect Slaterpaull on this project. Requests for proposals were issued on April 15, 2015 with a bid opening scheduled for early May. The construction process will begin with the construction of CTEC, move equipment out of MA/CTC, raze MA/CTC, construct new parking lot and finally redesign the front main parking lot and add spaces to Fine Arts Center parking. “The faculty and staff have enjoyed working with the architects. They have made it easy to share ideas and asked for input from everyone. The redesign of the front parking has been discussed and the plan calls for additional parking spaces while still maintaining the concepts of the master plan,” shared Dr. Dee Ludwig, Vice President for Learning. EWC College Relations Director Tami Afdahl will provide a narrated walking tour of campus which will allow participants to see the current campus facilities, recent renovations, current construction projects and future footprints of CTEC and the Agricultural Technology Education Center (ATEC). Tours will be held Wednesday, April 22 at 9:30 am, 1:30 pm and 5:30 pm. Each tour is limited to 15 individuals and registration with the EWC Community Education Office is necessary.